Carol: "Larry, I think she's dead!" Larry: "Try giving her the present." Woody Allen is, of course, one of the greatest comedy writer/director/actors of all time. But when he is thought of in this way it is often for his 'earlier, funnier ones' or for the more mature masterpieces like 'Annie Hall'. But for me; the masterpiece of his comedic abilities came with the underrated 'Manhattan Murder mystery'. I love 'Annie Hall,' don't get me wrong. But it's not laugh out loud funny. Nor is it meant to be. It's a very honest portrayal of the complexities of modern relationships. And some of the insights are inherently amusing; but that doesn't lead to hilarity, and nor was it meant too. Also, whilst I of course find his early comedies funny; for me they have aged - and it's something Woody agrees with; he often states how he thinks comedies age badly. Many of his pictures have been funny; often hilarious. But I really think that 'Manhattan Murder Mystery' is the funniest. Nearly every single bit of dialogue is a one-liner, especially from Woody; and the laughs just keep on coming. His relationship with Diane Keaton is a lot funnier than in anything they've done together before. They are so at ease together; so confident performing together; it's a real joy to watch. I definitely think that comedy is funniest when there is no cutting. This is what is so great about many of Woody's films, especially from this period; he doesn't use the camera and editing to tell the story. He uses the story to tell the story. Most of this film plays out in long, roaming master-shots. It gives a natural feel to everything that is happening on screen - and Allen, Keaton and Alan Alda seem to revel in it. The shooting style of 'Manhattan Murder Mystery' is one of the most impressive things about it; and it's the same for 'Husbands And Wives' which came the year before it. I think if I was to take a scene from either of them and tell a film school I'd shot them; they'd make lots of comments about bad hand-held shaky camerawork, and terrible framing. However, this is what is so great about these films. Woody was known to tell his Director Of Photography Brian Di Palma not to worry if the actors were out of frame. All that was important was that they say their lines and perform well; if they're in shot or not in shot, the audience will still get it. It's a style which is extremely refreshing compared to the typical Hollywood films where any emotion or important information is delivered in a close-up. Here, Woody has enough respect for his audience to let them add up two plus two themselves. The laughs come thick and fast; because they are delivered to us so naturally; not forced on us by cutting to close up or forcing us to see things. It may only have a 7.2 on the IMDB - and Woody himself has been known to talk about this film as a lightweight comedy - but for me, this is a masterpiece. It's Woody Allen at his comedic best; every line is a killer and the performances are amongst the best I've ever seen in a comedy. u ended up on a makeup blog to bring out that inner-diva on you!! If I remember correctly, Annie Hall, in its original cut, was a murder mystery with a romantic subplot. After seeing the first cut, the editor convinced Allen to cut out the murder mystery and stick with the romance, shooting some extra scenes to make it work. 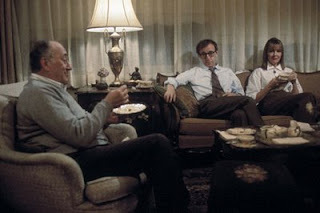 Manhattan Murder Mystery is the murder mystery that was supposed to be Annie Hall as I understand it. I think that was at the script stage, rather than something that was shot? I don't totally remember though. I'm about to read 'Woody On Woody' again, so I'm sure I'll find out... and remember this time!. I LOVE this movie. I found it on VHS over 10 years ago and was thrilled to finally get it on DVD. I totally agree with you about its timelessness. And hilarious one liners? They're non-stop. I wish there were some current movies out that were this observant and entertaining.